... or the Queen, for that matter. Almost every social system has its elites; the lords, ladies, dukes, princes, knights, viziers and barons that rule the teeming masses. The Noble's Handbook, from Green Ronin Publishing's Master Class line, introduces the noble as a new core class for the d20 System. The daughters and sons of the rich and powerful, nobles derive their power from breeding and influence, as well as the finest training and equipment money can buy. * 5 new prestige classes, such as the determined Commander, the chivalrous Lord Knight and the scheming Mastermind. * A new system for demanding satisfaction from those who dare offend those of noble blood, along with dueling cards to make the process of vengeance simple. * Over 20 news feats, including Bloodline and Ruling Family. * Roleplaying and campaign advice for nobles in a variety of different settings. * Rules for establishing and running noble houses. * 5 sample noble houses useable in any fantasy campaign. 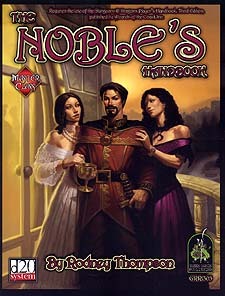 Take your game beyond the dungeon and into the realm of the bluebloods with The Noble's Handbook.